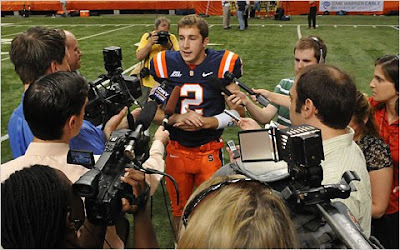 Syracuse University head coach Doug Marrone has tabbed former Duke hoopster Greg Paulus as his starting quarterback for the 2009 season. Paulus last took a competitive snap from center in 2005, in high school. He's been hanging out in Cameron Indoor Stadium for the past four years playing round ball for some coach whose name I can't spell and don't care to learn. It will be interesting to see how this plays out as the season begins and progresses. If I can't learn to like him as a football player anymore than I did as a basketball player, it really won't make much difference to me. Here's hoping some defensive ends get some really good shots on him.